Plant Cherokee Blue Mustard seeds 1/8" deep in a sunny location in well-drained soil in the fall or spring. 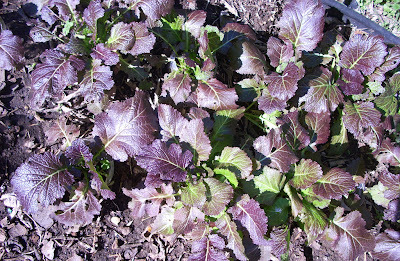 The Cherokee Blue Mustard in this blog and video was planted in late September and the seeds were harvested the last week of May. Cherokee Blue Mustard grows through the winter here in Texas. Here is a pic of Cherokee Blue Mustard when it was about 2 weeks old. When the Cherokee Blue Mustard is over a month old, it starts to lose some of its blue color and becomes more deep emerald green. Harvest the young leaves to eat before it begins to flower. 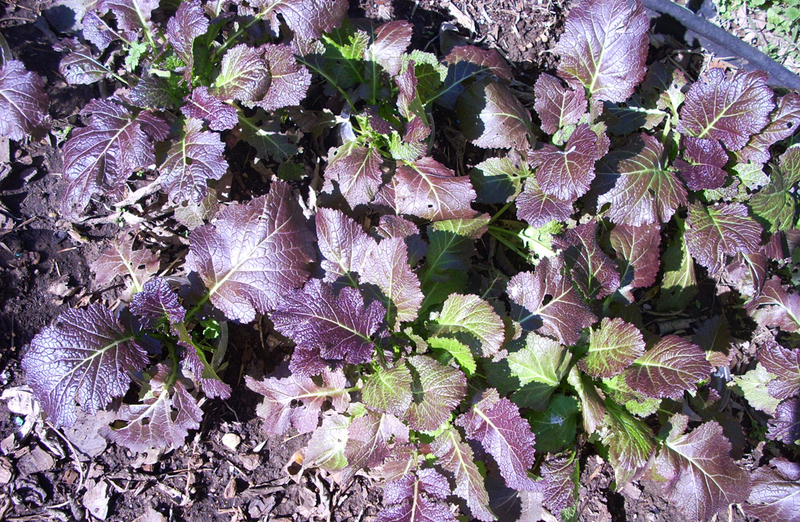 Instead of harvesting the entire plant, you may pick the outer leaves as needed for salads and cooking. This practice gives you more of a harvest for a longer period of time because the plant keeps growing more leaves from the center outward and you don't have to wait for a new plant to grow. Once the plant begins to flower and make seeds, the leaves will begin to get tough and taste more acrid. At this stage the plant will make less and less leaves and will put all of its energy into making seeds. If you want to grow Cherokee Blue Mustard for seeds, let the flowers bloom and become pollinated by honey bees and butterflies. 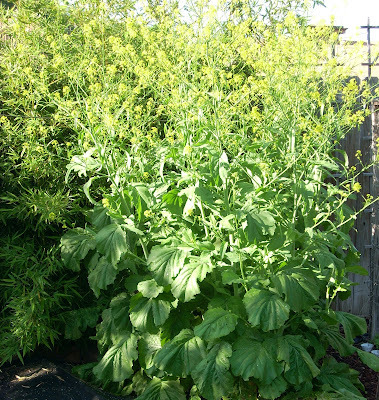 It is quite a beautiful plant when it is flowering and will grow 6' tall. The flowers will then turn into individual seed pods that contain 8 to 12 small round black/brown seeds each. When the seed pods are golden brown and the seeds inside are ripe (dark brown), the seeds can be harvested. To harvest, snip off the stems filled with seed pods and put them in a large sack. Let the seed pods dry for one week in the sacks. Many of the seeds will fall out of the seed pods and be captured in the bags while they are drying. To remove the remaining seeds from the pods, gently rub the stems with seed pods together between gloved hands over a sack or newspaper. Now use a collander over a large bowl to sift and separate the seeds apart from the husks. You may need to sift several times to finally remove the husks. You can take great credit for publishing about this.Theres a heap of important info on the internet. but it can be difficult every now and then.You have done a fantastic job with this one.How do you do it? Do you have seeds? Southern Seed can no longer supply them. Sorry, it has taken some time to get in touch with you. If you can share your address, I will mail some Cherokee Blue Mustard seeds to you. This is a great time of the year to plant it in Texas.